Valentine’s Day is a beautiful time of year as we’re reminded to stop and appreciate that special person in our life. This year, why not opt for something other than your go-to roses and chocolates, and instead treat your partner to a romantic weekend away in the idyllic Cornish countryside? It’s a gift guaranteed to make you very popular with your other half! To help you on your way to making it the most unforgettable weekend, here is a list of what we consider to be the most romantic walks in Cornwall. The name says it all. Imagine a glorious walk through stunning coastlines so splendid it seems just that: the land’s end. Well that’s what you get here. To the north of Lands’ End you’ll find the vast sandy beach, Sennen, which is the locals’ choice of beach destination. Enjoy a stroll along the beach or continue walking past the Maen Castle to reach another incredible stretch of coastline to the south. After your leisurely stroll, taking in the glorious surroundings, head to the Old Success Inn – a local hang out for fresh food and friendly service. Enjoy some historic ruins along this stunning coastal walk at Tintagel. On a grey day, the spooky atmosphere will have you holding your other half close for sure! The Visit Cornwall site sets out a terrific 5-mile circular walk, which allows you to take in the cliffs outside the village, Tintagel Church and the cove of Trebarwith Strand. All in all, this would have to be one of the most spectacular walks in Cornwall. This walk, stretching from Boscastle to Valency Valley and Fire Beacon Point, has been dubbed one of the most romantic walks in Cornwall. Why? Well, there are about five good reasons! The walk encounters a magical waterfall, a fairy tale-like wooded valley, the remote church of St Juliot, more beautiful coastal views and the picturesque Boscastle Harbour. Enough said. Gillian Creek has become quite a popular destination to visit, but this is one of the best walks in Cornwall to keep you away from the crowds and allow you to enjoy rural Cornwall in all of its glory. Start at the New Inn, which features classic thatched roofing and offers a beautiful back garden where you can explore Gillian Creek and Helford River. You can walk through Helford to the coast path until you hit Dennis Head, which provides breath-taking views over Falmouth Bay. Or, if you’re feeling lazy, just spend time unwinding together at the New Inn with all your classic pub favourites. Last, but far from least, is the Cadgwith walk. Take the southern route from the fishing village and explore the Devil’s Frying Pan. Here, you can explore a collapsed sea cave. Continue strolling on this beautiful coastal walk as far as Church Cove. You’ll probably be feeling a bit peckish after this 5-mile walk, so why not head into the charming Cadwith Cove Inn and enjoy a delicious pub meal? 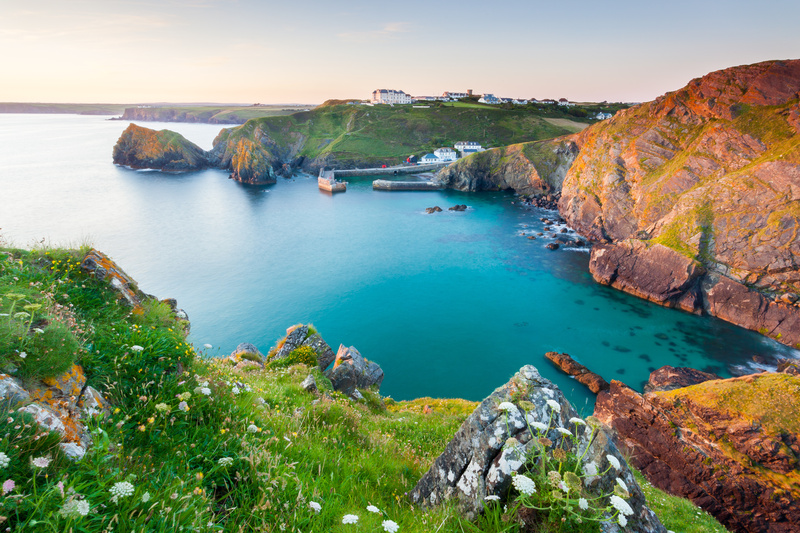 If you’ve fallen in love with Cornwall (trust us, it’s easily done!) and are dreaming of owning your own holiday home here get in touch today! We’re certain you’ll find the perfect holiday home in this romantic part of the Westcountry.